Discussion in 'Battle Reports' started by Itepixcauh, Apr 12, 2019. Brothers in arms, it seems i cannot maintain the schedule of Battle Reports as steady as I would have liked BUT I made my pilgrimage and the Lady herself has given me her blessing to join the latest two reports into one! So please excuse me if my usual detailed Reports are turned down in favour a faster approach. A VERY though nut to crack indeed. He is so much faster than me so I choose to refuse a flank and concentrate in negating him his primary token and capturing the two secondary tokens on the middle and right. My two Beasts will be the guardians of the left flank, with a forest and Ensnare there they are in a good position to do so. 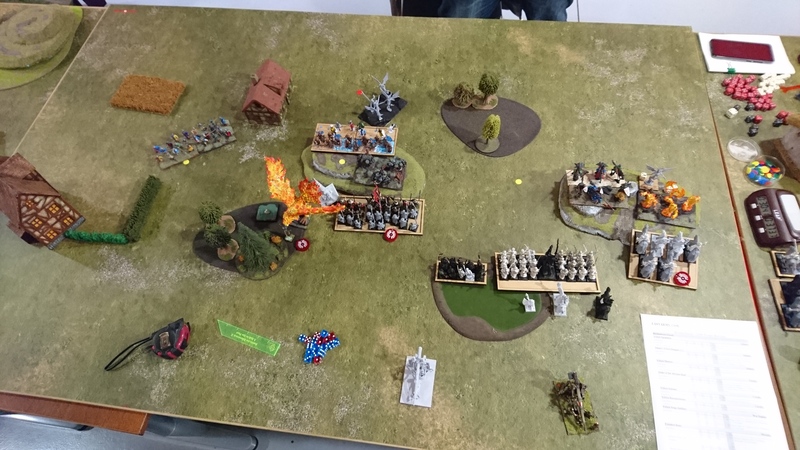 I win the first turn roll and immediately bait his Elohi on the right flank with my Reconnoiterers on the hill and proceed to move hard into the middle being sure that the only charge he has is with the Elohi into the Reconn. He actually TAKES IT! and advances too generally. With that Elohi Horde so tempting on top of a hill just in front of my two cavalry units the decision is very easy, both slam into them while the rest of my army mostly holds ground as I have the shooting advantage and a good position behind the hill. 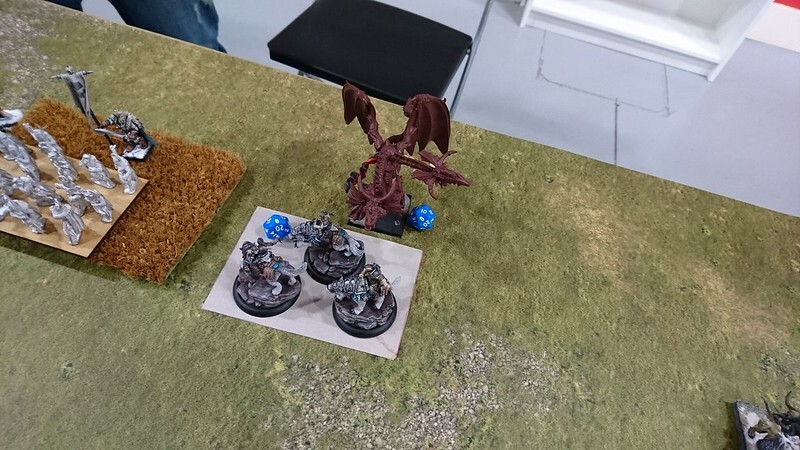 I snipe off his War-Wizard with my Beasts Breath. And then the pain begins... My cavalry rolls terribly and on top of that I fail to get a good nerve roll on the Elohi so they survive, on his next turn he charges the Elohi and Knights into my Cavalry and rolls like a madman on the Nerve, killing the Initiates in one go and severely damaging the Hunt. I gave him a charge with his Ogre Palace Guard, wounded from shooting into my Spearmen and they bounce off but again JUST he is rolling like a mad man. His Phoenix also finds a spot to charge my Devoted doing a wound. 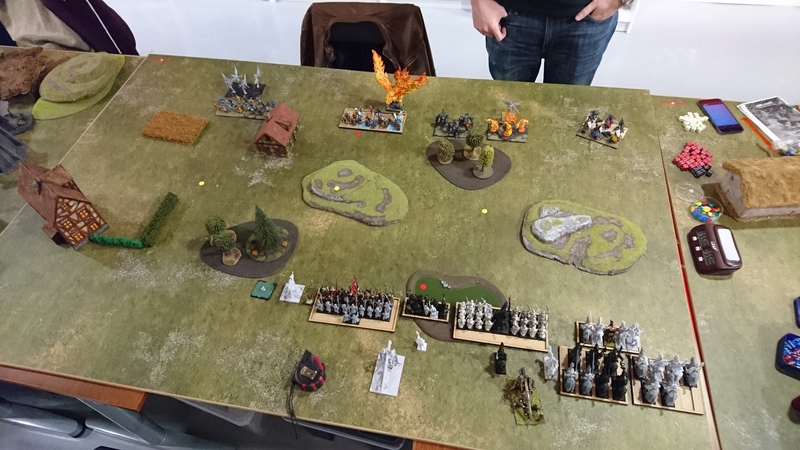 We move a bit further inot the future and his Elohi charge and kill my Rangers in one go, his Knights finish mine and turn to face the middle while Ogres that had been double oned, kill the Spearmen. At this point I cannot win no matter what I do, I only have two forsaken Beasts left that can score but I might be able to pull out a draw if I'm extremely lucky. 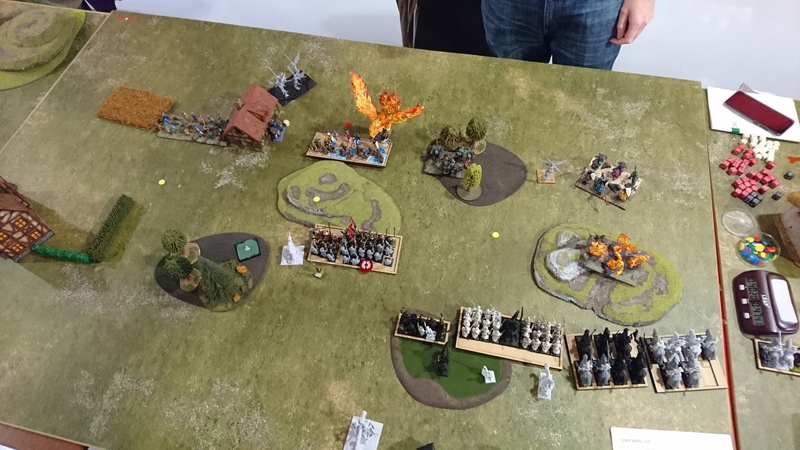 I maage to finish the Ogres with my Beasts shooting, and succesfully block the Knights from the other objective thanks to weakness and a very stubborn Adjutant. My Hunter manages to kill the Ur-Elohi too, but at the end of six he is still winning 4-3 as the Elohi capture the objective that the knights were blocked of. We have a seven too an the knights finish the adjutant and move to get the objective while the Elohi charge the Beast holding the middle objective and while they don't kill it, they still get it due to unit strength. I probably had the worst luck in this game that I had in the whole league, that combined with my opponent not making mistakes except taking that bait (that actually worked for him) and rolling nerve tests that literally never got under an 8.... well there is so much you can do. I know this opponent has had TERRIBLE luck throughout the league, not even joking here TERRIBLE, so I'm actually very happy for him that luck finally smiled at him. He played a good game and I made some mistakes here and there. 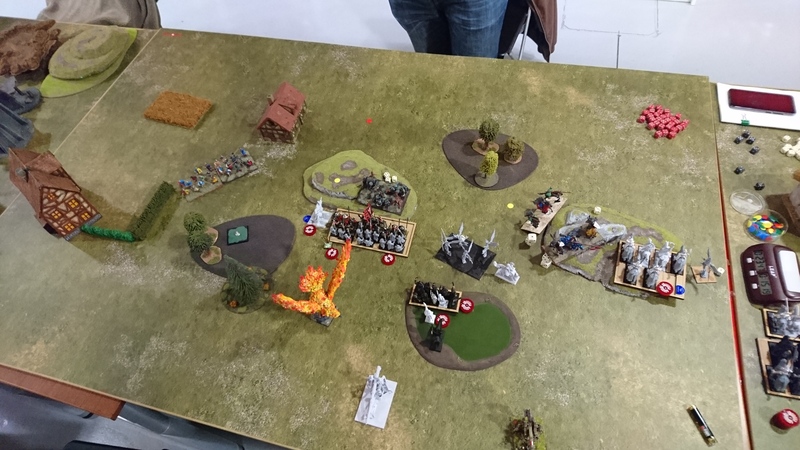 We jump a month from the previous report, next league game for the Brotherhood, thus time playing Control against the devastating Varangur and an exceptional player on top of that, luckily I do think the scenario this month favours me as I have massively more US that he does, but we will see! Everything KILLS a lot and has a FU**ING TON of Nerve! Mine for this game is different, as I felt having tons of US could come in handy and I could use some static shooting I took the Archers back with me. - 2 Devoteds, one with Martyrs Prayer and the other with Weakness and Inspiring. 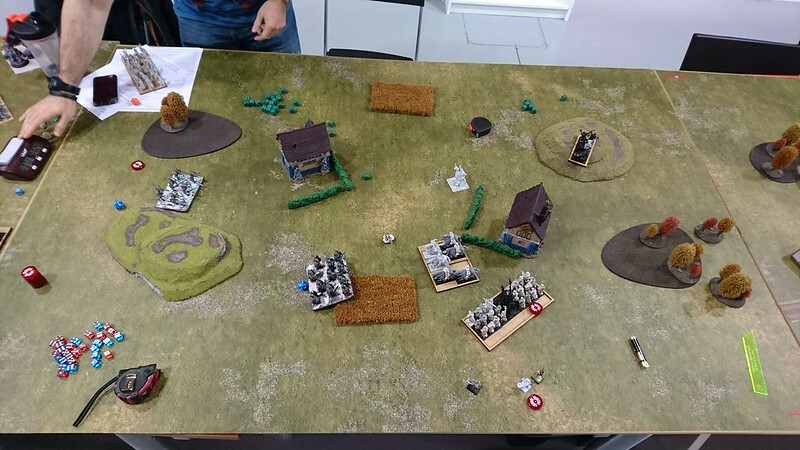 My idea was to take the 4 sections of the board on the Right HARD while deploying the shooting on the other flank last to hopefully have no enemies there and try to capture those other two unopposed. Instead of mimicking my deployment (which I was hoping he did) he was clever and did his own thing. 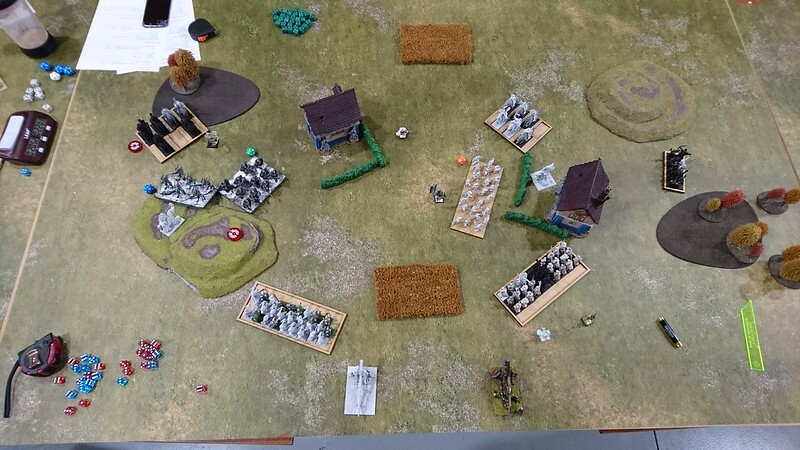 I had to re-consider as I really wanted my shooting active for as long as possible so I deployed my speed bumps on the flank of the Archers to serve as an annoyance and keep the Archers shooting for as long as possible. 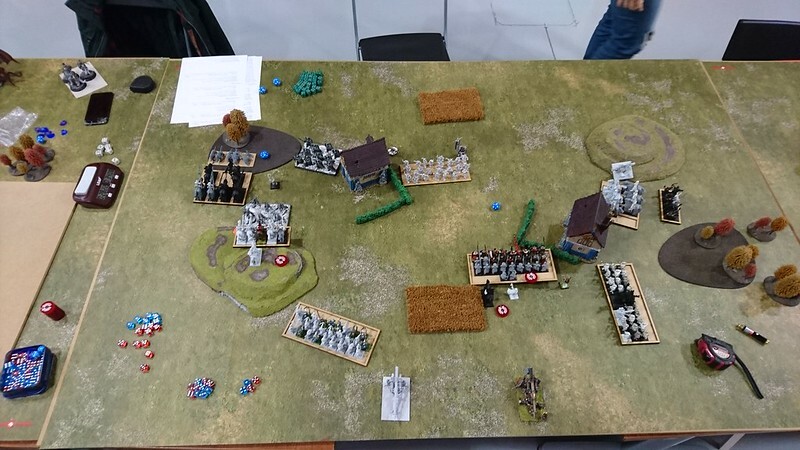 My TWO Siege Artillery hit the King on the head doing 10 massive wounds and Wavering him which is amazing and the combined shooting of the Rangers and Bowmen take the Direfangs to 8 wounds but I sadly fail to waver them by very little. He then starts to push forwards leaving the Direfangs in range if my Spearmen but outside on mine. 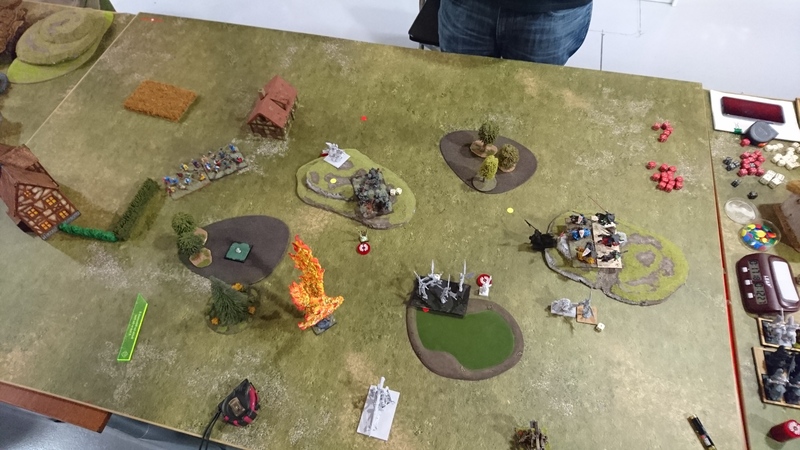 Next turn I shoot the King again and one Siege impacts killing him! The other shooting fails to Waver or Kill the Direfangs again, they in turn charge the Spearmen doing something crazy like 15 wounds and Wavering them, If I cared to look at their profile I would have seen the word Strider there and move accordingly backwards to have another round of shooting. 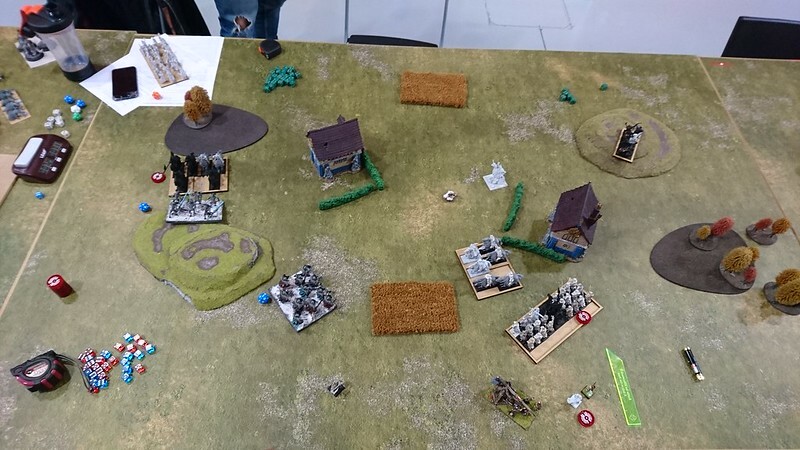 I did kill the Wolves on the right too relieving that flank and moved my units to face the middle. On the right I blocked as many units I could with mine. I shoot the Direfangs off the board and in response the Horde of Bloodsworn kills my Spearmen, and the Fallen kill the Reconnoiterers and my Initiates rout the other troop of Wolves. Matilde joins the fray. In my turn instead of charging the Bloodsworn hindered I position myself and shoot them. The Bloodsworn charge the Martyrs as they have few option they bounce back and get multicharged in all facings and get destroyed. The Abyssal-Hunt have to charge through the Skald which they do and get into their rear. On the other flank Matilde with the Sons of Koorgan kill the Bowmen in one combat and the fallen fail miserably to even waver the Initiates, they roll terribly bad. Matilde then jumps and kills a Siege Artillery. Not much happens after that, the Fallen kill the Initiates and Matilde routs the second Siege Artillery. I refuse to charge the Sons Hindered as they are outside the charge range and I don't want to give them a free combat, what I do is just reposition to be sure I'm controlling 3 sections and disputing the one with the Sons. 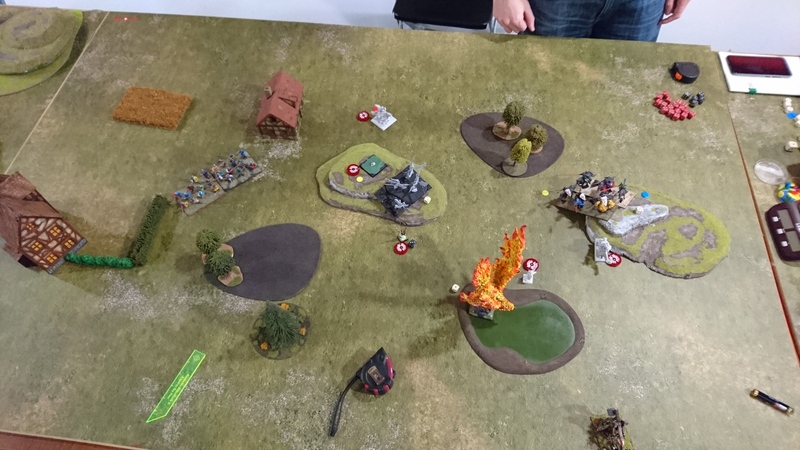 The game ends on turn 6 with a solid victory in the scenario and a draw in kill points. LizardWizard, Lizerd and Sreeves like this. 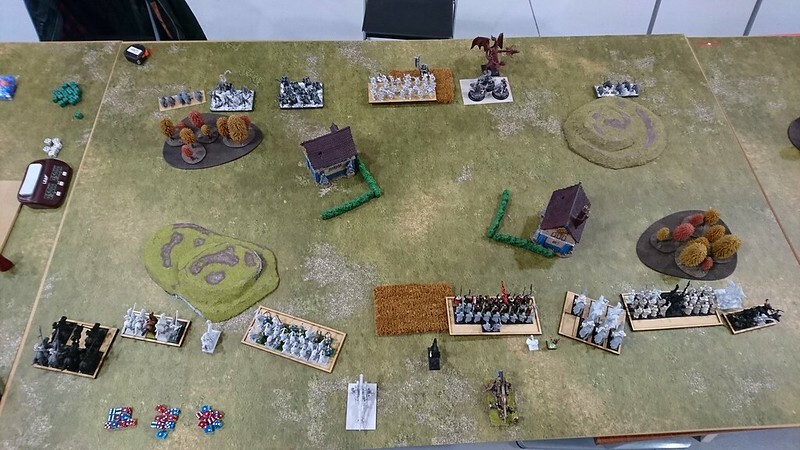 Pretty cool battle report. I liked the models in them as well as the overall tactics. Very good games and definitely a good read on a rainy day. Oh I used lizards and wrote reports for them for FOUR years! Check the rest of the subforum for tons of reading time! Oh dang you got lizards? Sweet! I’m going to find the battle reports!